As per last year, I had agreed to help out as a ride marshal, and I’d already been part of a clothed test ride the previous Saturday. 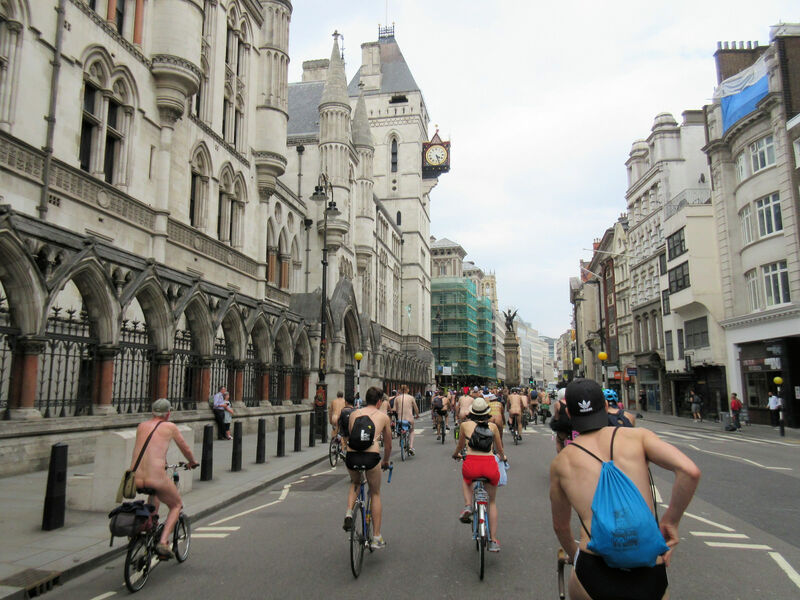 Now having resolved to participate in what would be my ninth London Naked Bike Ride, I couldn’t be half-hearted about it – the body paints would be coming with me. For a fifth consecutive year I would be amongst the riders leaving from Trinity Square Gardens. I arrived at 2pm, forty-five minutes before our scheduled start, and found the place already awash with cycling enthusiasts. Friends on the scene included Cy, who is increasingly active in organising the whole London ride, and Natansky, who always organises this Tower Hill start point. Other familiar friendly faces included Paula, veteran of many naked bike rides, and my fellow marshals, Chas and Pawel. Mike was to be a clothed advance guard who would give warning of possible route obstructions, whilst Peter and Raid were busily creating spectacular body paint designs. Me? I kept it basic like last year: self-applied top half all gold, with bottom half a vivid pink. A combination of major roadworks at the junction of Trinity Square with Byward Street, plus what looked like our biggest ever group leaving from this start point, meant it was decided we should lead out from the north gate of the gardens; me and Pawel in front, and Cy coordinating. Gradually we edged out towards the Jehovah’s Witnesses at the end of the road. Chas held the rear, Natansky shuttled… and at 2:45pm we were off. 2:48pm on Lower Thames Street: …away we go! Byward Street, Lower Thames Street, Upper Thames Street – we wanted to start slow and steady so our large group could keep together, yet two guys were intent on racing ahead. They didn’t know the plan so I had to shout at them constantly. A left at Queen Street Place, a pause at the end of Southwark Bridge, and still they raced on. I yelled, “Wait, you fuckwits! !“, but it made no difference. At least the rest were a great bunch. We all took a right into Sumner Street but needless to say our breakaway pair missed the turn despite my continuing bellows. I think they got back with us, but frankly I was beyond caring. Our next wait for stragglers was on the junction with Southwark Street, near Tate Modern. Here, one of our naked cyclists suddenly began reeling with howls of despair – he’d just been spotted by his entire extended family on a day out. Eek! We turned right into Blackfriars Road and continued across Blackfriars Bridge to a left turn for Victoria Embankment. It takes ages to get everyone down off the bridge so we had a couple more long pauses in sunshine by the river. A gang of three or four young boys on bikes appeared and one informed us we were “disgusting“; though apparently not enough to deter him from following us for an hour. Usually at this point we go up Northumberland Avenue to Trafalgar Square, then back down Whitehall. Today, however, Whitehall was infested by a rabble of violent English neo-Nazi knuckleheads shouting for their ringleader to be let out of gaol. Our advance guard, Mike had gone ahead by tube and called to confirm it was a no-go area, so we continued on Victoria Embankment and met him at the corner of Westminster Bridge. We wheeled freely over Westminster Bridge then went from Westminster Bridge Road into York Road and Forum Magnum Square. The earlier detour had cut short our route so we were the first group to arrive, at 3:40pm. Eventually others joined us and as our numbers swelled it was clear this must be the largest ever London Naked Bike Ride. I did my best to encourage riders forward so there would be space enough for everyone. The stop at Forum Magnum Square is a chance to park the bike and chat with people. One bystander said he wanted to do the ride but his partner didn’t like the idea of him naked in public. Did I have any advice? Well some ride clothed, some in underwear or a mask, some only go naked for part of the ride, but ultimately it’s about love, respect and trust. Good luck, Dion! We were on the move again at 4:05pm, starting down Belvedere Road. One organiser with a clicker counted us as we left and reckoned we had 1,300 riders taking part – a new record. From Belvedere Road we inched up Concert Hall Approach, swung round to Waterloo Bridge and continued through Lancaster Place before heading east along Strand via the broad sweep of Aldwych. Strand became Fleet Street from where we soon veered left into Chancery Lane. I was now no longer a leader of the ride, preferring instead to drop back into the pack and let more experienced organisers take change for the remainder of our protest. A left on to Carey Street, followed by a right on to Searle Street led us to Lincoln’s Inn Fields. The time was 4:30pm and I’d been on the road for an hour and three-quarters. We paused at Lincoln’s Inn Fields till 5pm. It was a chance to use toilets, have a rest and find friends, both old and new. A Spanish couple approached and asked to have a photo taken with me as I was in the colours of their national flag (I guess the pink was red enough). Elsewhere I greeted Calu, whose Naked Movement events I’d joined on a couple of occasions. All around were familiar faces from bygone rides. When at last we’d completed a circuit of the square, a course was charted for Covent Garden. We went along Remnant Street, Great Queen Street, Long Acre, Bow Street, Wellington Street, Tavistock Street and Southampton Street where we hit our first and only set of cobble stones. These juddered us a brief way along Henrietta Street in the direction of Bedford Street but – a decisive moment – would we turn left or right? Our protest ride was putting smiles on faces wherever we went. By contrast, on-going neo-Nazi thuggery in Whitehall had caused injury to police officers and resulted in five arrests. It meant we would not be able to complete our intended route, round Trafalgar Square and along the Mall, so instead we invoked our Plan B that had been tested by organisers the weekend before – upon reaching Bedford Street we turned right. This fresh detour took us through the heart of London’s West End “Theatreland”, and it was superb. As we went our merry way into Garrick Street, Cranbourn Street, Charing Cross Road and Shaftesbury Avenue the crowds grew bigger and more boisterous. So much joy and support! It was as if for one afternoon we’d become the capital’s premier tourist attraction. We were loved and loving it. It took an eternity for us to advance along Shaftesbury Avenue – feet were on the floor more than they were on pedals. Up ahead, Piccadilly Circus was still busy with traffic from Regent Street, which meant our naked throng could only cross over to Piccadilly when the lights gave us right of way. It was slow progress in modest-sized groups but, with the finish line not too far away, I don’t think anyone was in a hurry. Piccadilly itself was a different proposition. With the Mall now denied to us, it became our new home straight – free-flowing and literally straight. No car culture to hamper us here; not on our side of the road anyway. We surged past the Royal Academy of Arts, The Ritz hotel, artists at the edge of Green Park, Bomber Command Memorial, all the while bearing down on Wellington Arch ahead. Like last year we didn’t finish beneath the arch itself. Instead we turned left onto Duke of Wellington Place and went a short distance along Constitution Hill. After a final few moments of cycle congestion we entered Green Park to finish at a circle of trees. The time was 5:45pm – exactly three hours from when we left Trinity Square Gardens. For me, the London Naked Bike Ride of 2018 was over. 5:39pm at Duke of Wellington Place: queuing to finish – © A. P.
Whilst others were preparing for a naked ride back to their start point, or a clothed ride to the WNBR London Afterparty, all I wanted was to get home and shower. It had been an excellent ride made all the more exceptional by our detours, but I missed sharing it with my partner, Esther. Hopefully next year, though. 2018 may have been the biggest London Naked Bike Ride yet, but there’s still more peaceful protesting to be done. Licht Pascal Fotografo – WNBR London 2018 is a photojournalistic record.